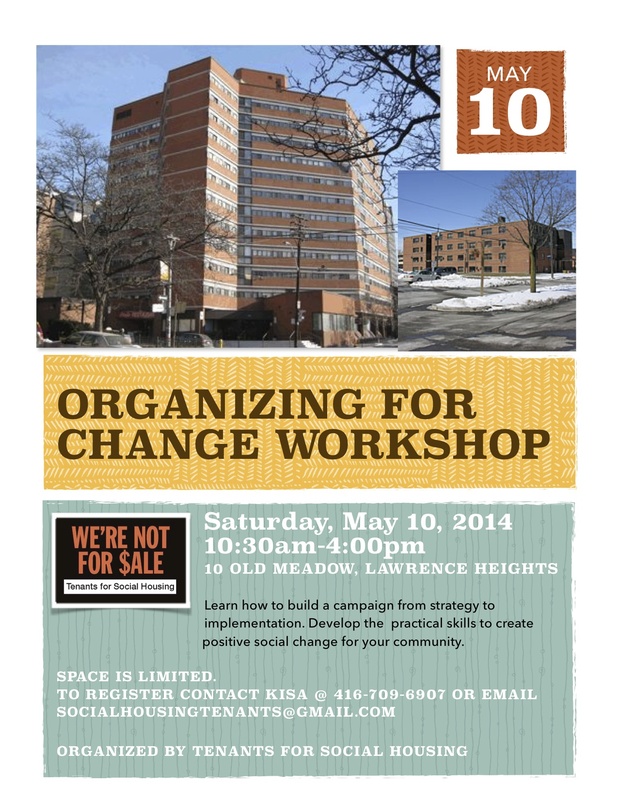 Tenants for Social Housing will be hosting a workshop called Organizing for Change on Saturday May 10th (10:30am – 5:00pm), to support the local work that tenants will be doing in the upcoming Toronto municipal election. Learn how to build a campaign from strategy to implementation, and develop the practical skills needed to create positive social change for your community. Raise the Rates!Restore the Community Start- Up Benefit! Organized by: Ontario Coalition Against Poverty, Parkdale Against Poverty, Parkdale Community Legal Services, Bread and Bricks Social Justice Group, and more! The Ontario government cut the Community Start-Up and Maintenance Benefit (CSUMB) at the end of 2012. CSUMB was a provincial benefit that helped people on social assistance to get and retain housing. For 2013, a patchwork of inadequate municipal programs has been set up to replace the CSUMB. In Toronto, the program is called the Housing Stabilization Fund (HSF). By the City’s own admission, the HSF has been inaccessible for many who need it, both because the City has failed to tell people how they can receive the benefit, and that the eligibility criteria to receive the fund have been too strict.In response to this situation, anti-poverty groups have organized clinics where people are assisted in applying for the HSF. These clinics have been followed by group actions where delegations of people in need of the benefit have confronted the bureaucrats in charge of the program collectively. In this way people have won benefits they need, and we have put pressure of the City to expand their eligibility criteria for the benefit.On July 17th we plan to continue this work but on a larger scale with a mass application clinic where people can get help on the spot in applying for the HSF. The clinic will include a meal and rally to demand the restoration of CSUMB and a raise in social assistance rates. Last year we fought back against the cut to CSUMB and through determined community mobilizations across the province we forced $42 million out of the government in money that they intended to cut. We know that community action works – let’s continue to push for the full restoration of Community Start-Up and Maintenance Benefit on July 17th! Written deputations will be distributed to the board in advance of the meeting, or at the meeting itself for late submissions. You are not required to pre-register in advance. You can sign up to depute at the meeting by putting your name on the speakers list. Speaking time for deputations is normally 5 minutes per person. If there are a lot of deputations the speaking time may be reduced, you should be prepared just in case this happens. Join T4SH at City Hall for the Affordable Housing Committee’s update on Putting People First, the Special Working Group report on the fate of the ‘stand-alone’ single family homes and the TCHC capital repair backlog. Come join T4SH at Toronto City Council for the release of the Ombudsman’s report on unfair evictions at TCHC. We demand better from our landlord! Join tenants in fighting for dignity and security in our homes. This will be the second item discussed at the meeting. On Wednesday July 18th, 2012 join East End Tenants and T4SH at the Ralph Thornton Centre (765 Queen Street East) from 6:30-8:30pm for a community meeting on the future of TCHC, affordable housing, and tenants. Speakers include Councillor Paula Fletcher, tenant Rosie Da Silva, and housing advocate Michael Shapcott from the Wellesley Institute. Join T4SH and Councillor Raymond Cho this Saturday July 14th, 11:00am-1:00pm at the Malvern Public Library (30 Sewells Road) for a Scarborough community meeting on the future of affordable housing, tenants, and TCHC. See details below. NOT ONE HOME SOLD! The City is taking a good first step in calling for a task force to stop the mass sell off of our homes and find the real solutions to the real problems. BUT, the City is still recommending the sale of over 60 homes, making families wait longer for affordable housing. Join tenants and ask Councillors to stop the stop the sale of even ONE home until sale of our homes all alternatives have been explored! The proposed sale of 740 TCHC homes has been deferred until the Feb. 13, 2012 Executive Committee Meeting. 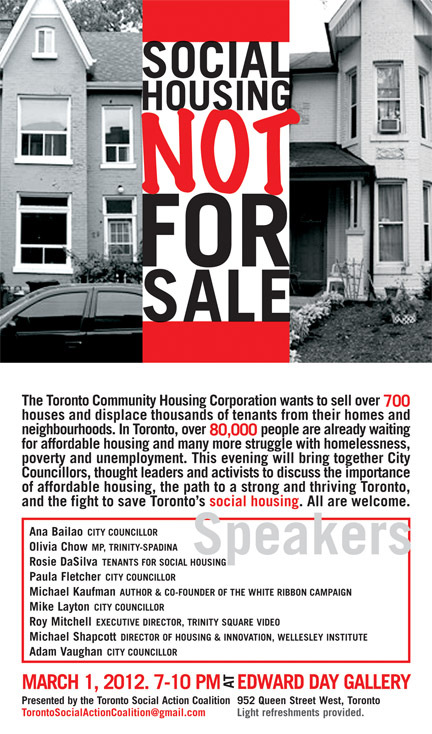 Tenants for Social Housing will be there with our allies and supporters to oppose this sale! Sign up to make a deputation (Email exc@toronto.ca or call 416-392-6627 before Thursday at 12:00pm)! Write an email to the Committee (exc@toronto.ca) and your councillor and let them know how you feel. 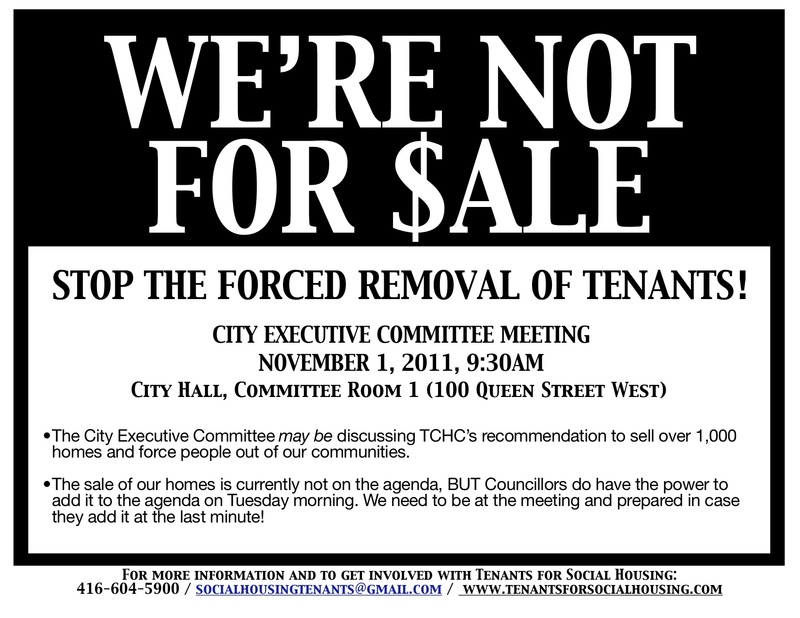 Join us in the Committee Room to show support for tenants! REGISTER TODAY to speak against the sale of our homes! This is our chance to make deputations about the sell-off of our homes. We need 100 or more tenants and supporters to register to speak against the sale! Register by calling 416-392-6627. A voice message directs you to 416-392-8485 or 416-392-7445. Both accept registrants for deputations. OR email exc@toronto.ca to put your name AND your friend’s name on the list. EVERYONE is encouraged to come out, whether you are going to be making a deputation to the Executive Committee or not. Please let T4SH know if will be attending (socialhousingtenants@gmail.com) so that we can make sure we have enough materials for everyone. Councillor McMahon is concerned about the proposed cuts to important community services and hubs, and the declining stock of affordable housing in the ward and wants to hear from you. Housing Action Now is a city-wide coalition of community organizations in Toronto working to advance the right to liveable and affordable housing in Toronto. This forum will discuss the role of the City of Toronto in creating and maintaining affordable housing. The event will be held at St. Stephen’s Community House (91 Bellevue Ave, in the gym) and feature speakers: Linsey MacPhee (Toronto Drop-in Network), Phil Nazar (Toronto Christian Resource Centre), Michael Shapcott (The Wellesley Institute), Beth Wilson (Social Planning Toronto) and more. Click here for details. Tenants for Social Housing continues to fight against the sale of publicly-owned homes and the involuntary removal of low-income people from their homes and communities. The agenda for the November 1st Executive Committee meeting at City Hall has been publicly released, and it does not include the sale of TCHC homes. This is despite a promise from TCHC that they would bring their report (recommending to sell homes) to Executive Committee, so that they could proceed with sales as quicly as possible. The Committee does, however, have the ability to add the sale of homes to the agenda at the meeting on Tues. Nov. 1st. Tenants for Social Housing thinks it is better to be safe than sorry. We will be at this meeting to protest the sale of our homes and make deputations in the event that this item gets added to the agenda. We will have a presence at the meeting. Please join us! Be prepared to make a deputation! Since this item is not presently on the agenda, deputations can not be scheduled in advance. If the item is put on the agenda on Tuesday morning, you can register in person at the meeting. PLEASE CONTACT YOUR CITY COUNCILLOR AND THE MAYOR TODAY. Let them know that you do not support the sale of any homes in Toronto Community Housing and ask them to vote against this report when it comes to Council (click http://app.toronto.ca/wards/jsp/wards.jsp to find your Councillor). Please make sure to .cc Tenants for Social Housing at socialhousingtenants@gmail.com. 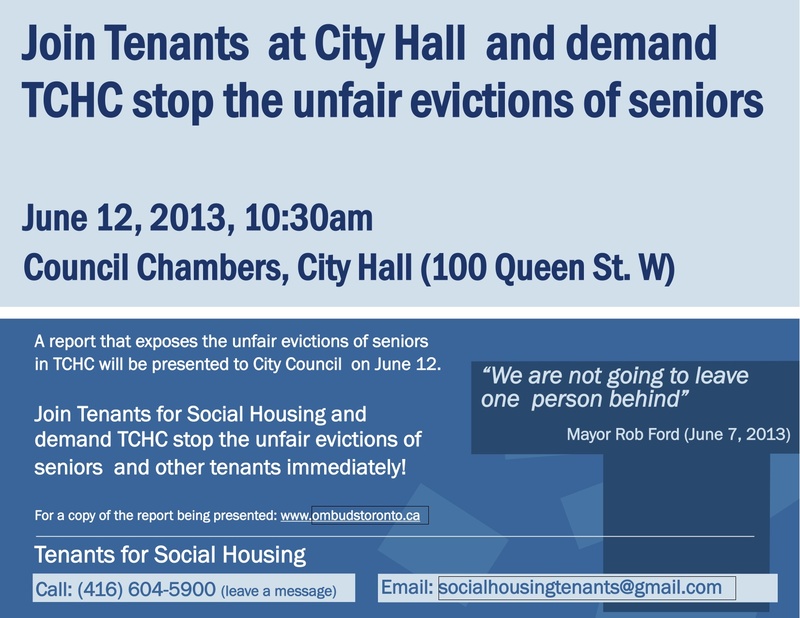 To get involved in the campaign, email socialhousingtenants@gmail.com or leave a message at 416-694-5900.